The ADTRAN NetVanta PoE Protector/Injector is a unique device that combines a port protector with a PoE injector in a single unit allowing multiple applications. 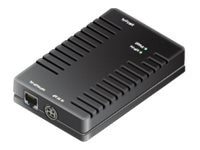 The NetVanta PoE Protector/Injector functions as a single port Ethernet surge protector and also provides 802.3af or 802.3at (PoE/PoE+) power to outdoor PoE-powered devices. These include outdoor APs, IP surveillance cameras, and other outdoor IP devices, eliminating the need for a local power outlet. The device also protects the switch port from voltage surges during lightning storms or AC power induction/cross currents that occur on the device side (AP, camera, etc.). Additionally, the protector/injector protects itself and the Ethernet port from becoming a fire or fragmentation hazard from lightning surges.